Common sage really does look common and bedraggled in winter, Even when it looks used and useless, it is actually still very useful and smells just as powerful. But the variegated sage that I have growing doesn’t lose any of its brilliance. Sage is another herb (like oregano,) that I keep dried in my seasoning cabinet, but that I love to pick fresh because, I confess, I have a scent fetish. 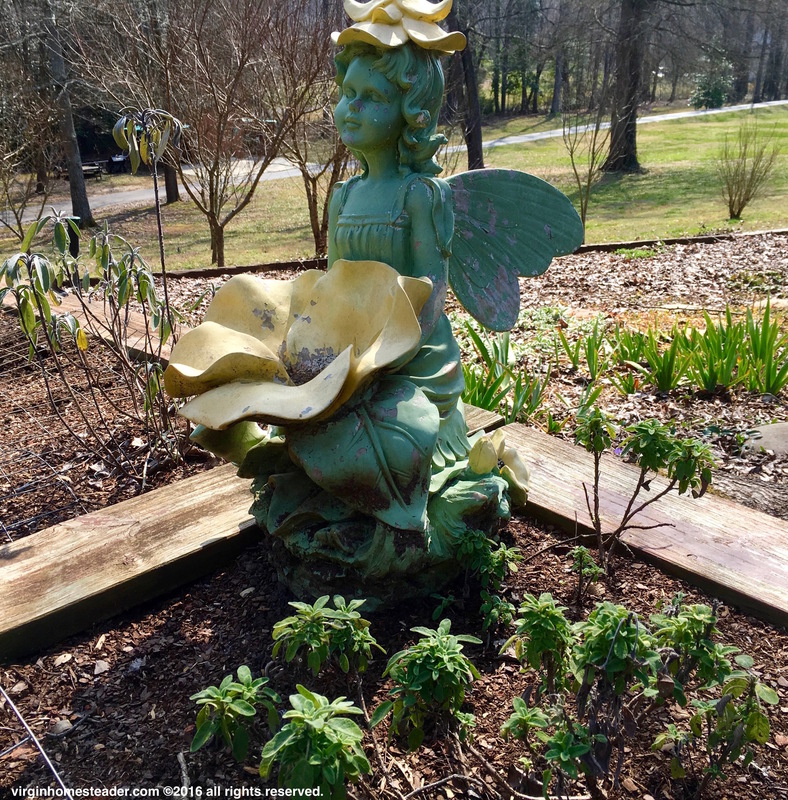 The variegated sage in front of this fairy looks more vigorous than the common sage behind her. But don’t let looks fool you. Good smells make me feel good. Even if I’m not cooking something with it, I still like to pick the leaves and rub them between my fingers, and then smell my fingers. I use sage to season fish and roasted chicken and in scrambled eggs. Sage is one of my favorite herbs.. Unfortunately I also tend to kill it every year. lol I’m hoping this year it will survive since I brought the potted plant into the house! I have also found sage to be finicky. Last year I grew a bunch of starters from seed and then planted them in probably twenty different spots in my gardens. I have about eight that remain this spring. My variegated sage, however, has been growing for five years in the shade of an ornamental pear tree.